Drip Irrigation is a modern and well-developed system for conserving water and reducing the cost of fertilisers, energy, labour and pesticides. Before this system of irrigation, sprinkler was the most efficient one. However, the drip irrigation system superseded the sprinkler system with almost over 90 per cent efficiency. Among various rationales for the adoption of drip irrigation system, the most important is the “reduction in water losses”. Water scarcity is increasing worldwide day by day and becoming a critical problem in today`s farming. Under such circumstances, drip irrigation system provides the most efficient use of water. Under this system water is applied directly to the root zone avoiding wetting of other parts which may result in infection to plants by certain diseases due to unwanted high moisture. Drip irrigation is a targeted water application avoiding unnecessary wetting of non-targeted areas such as plant leaves and sidewalks which reduces water consumption. Along with the efficient use of water, fertilisers and pesticides can also be applied directly through drip tapes or pipes. In this system fertilisers are applied to the root zone directly with uniformity instead of spreading it over the whole field. Thus fertilisers do not become airborne and are not wasted. With a well managed drip irrigation system, a scheduling system can be made in regulation of water and fertilisers according to the requirement of plants and crops. Due to application of water to the required area only, growth of weeds can also be kept under control. There is also no need to level a field as even unleveled and irregular-shaped fields can be irrigated through this system without wastage of water. The system also reduces labour and energy costs. Besides many advantages, the drip irrigation system has certain disadvantages mainly the `initial cost` of installing the system. It costs around 40K-50K per acre for vegetables. But this initial cost is worth investment and is useful for several years and is recovered from the production revenue in a short period of time. “The initial investment in drip irrigation system, in most cases, is recovered within two years of crop production,” says Allah Bux, the owner of Shahi Chipp Farm at Gadani Town, Karachi, where drip irrigation system has been installed on large scale. But because of high initial cost of installation, it is difficult for small and medium land-holders to install this system. However, the growers can take a start by installing simple drip irrigation system on small acreage. It has also been observed that the intensity of sunlight affects the installed drip tubes and shortens their lifespan. But still the irrigation professionals prefer the subsurface drip irrigation (SDI) instead of simple drip irrigation. In subsurface drip irrigation the drip tape/tube is buried under the soil surface protecting it from sunlight and also decreasing evaporation and water runoff. Another disadvantage noticed is that if water is not properly filtered it can choke the drip tapes which cause clogging. But with a little care clogging can be controlled. Drip irrigation can be unsafe if the top dressed fertiliser requires sprinkler irrigation. To avoid this disadvantage before adopting the drip irrigation system a grower must choose the right system for his field. Choosing the system is very complicated because each and every application is a slightly different for different crops with options available for all of them. Except for those growers who are not adopting the drip irrigation system though they are familiar with it; mostly assume that drip irrigation causes problems like germination, salinity water wastage and time. But they should realise that all these problems are faced when the system is not properly installed. Installation of drip irrigation system requires a well planned study of the relevant factors such as land topo- graphy, soil, water, crop climatic conditions and suitability of drip irrigation system. 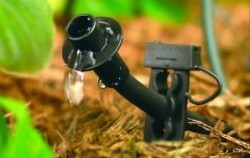 The drip irrigation system is used by farms, commercial green houses and kitchen gardeners worldwide. It is adopted extensively in areas facing water shortages mostly for sugarcane, cotton, maize, tomato, citrus, brinjal, grapes, banana, onion and cauliflower crops. Opting for drip irrigation system is a profitable exercise for growers as the system reduces water, fertiliser, pesticide, energy and labour costs increasing per acre yield and improving the quality of crops. Therefore, the government must help the farmers in the installation of drip irrigation system in their fields to overcome water shortage and make agriculture affordable. This can be done by providing farmers with interest- free loans to purchase the equipment needed in the installation of this system at affordable rates and make the country food secure.